What is a CERAMIC COATING & why do we need it? Here's the sad truth about factory car paint: it is super thin. Car manufacturers don't make cars to be indestructible, so naturally the paint that makes your car so shiny isn't indestructible either. After a few years of the elements beating on our cars' paint, and years of harsh car wash bristles and detergents used to clean our cars, our cars' paint will look pretty old. It'll probably look pretty scratched. And it'll probably look pretty dull. Fortunately, we have the BEST preventative solution to the inevitable swirled-up car finish. Ceramic Coatings! We offer Optimum Gloss-Coat (2 year ceramic coating), Optimum Paint Guard ( 3 year ceramic coating), as well as Optimum's flagship ceramic coating: Opti-Coat Pro Plus (7 YEARS!). Ceramic coatings are much like the clear coat that already exists on our vehicles, except it forms a shell of protection that is glossier, slicker, and less prone to wash-induced swirl marks and marring. Ceramic coatings create a self cleaning finish that is considerably easier to wash and maintain compared to conventional waxes and sealants. Unlike waxes and paint sealants that require frequent reapplication, our ceramic coatings provide constant, unyielding protection for years! Which CERAMIC COATINGS do we offer? As authorized installers of the coveted Optimum Opti-Coat brand, we are authorized to install the full lineup of Optimum Opti-Coat ceramic coatings. 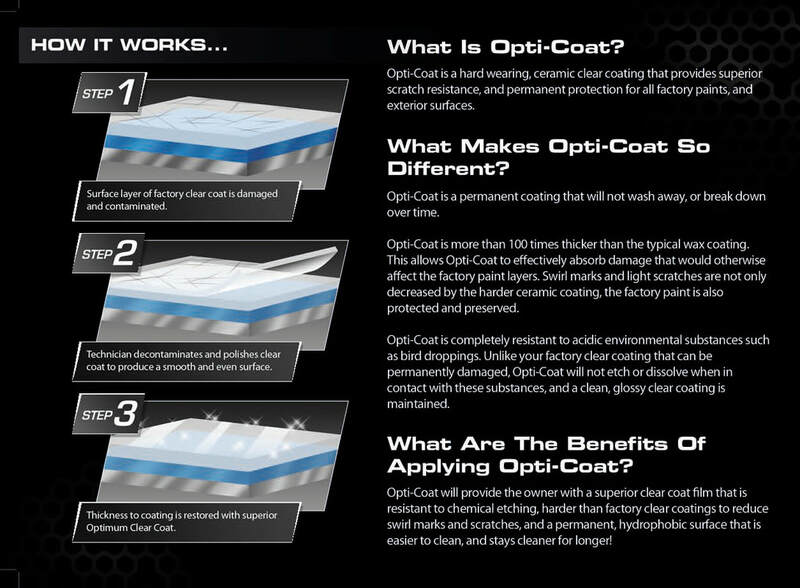 Our entry-level coating is Optimum Gloss Coat. Applied to painted surfaces for superior gloss, Optimum Gloss Coat is by no means entry-level, other than in comparison to it's pro-applied-only brothers: Optimum Paint Guard, Optimum Opti-Coat Pro Plus. Optimum Gloss Coat provides significant gloss, harder-than-paint hardness, and impressive water beading and self-cleaning characteristics: all while lasting up to 2 years depending on environmental and driving conditions. We carry Optimum Gloss Coat in stock at all times, and we require 2 weeks in advance to schedule an application of Optimum Paint Guard & Opti-Coat Pro Plus. Paint Guard, Opti-Coat Pro Plus are only available through authorized installers like Detail Pros, and they include warranties backed by Acuity Insurance. Lastly, the coatings will even show up on your Carfax report, which is pretty neat! All Optimum ceramic coating applications must include a car wash, clay bar treatment, and polished and prepped paint. Please refer to the CAR DETAILING page for pricing.